This was working perfectly, until I upgraded to High sierra. After upgrading to High Sierra, macOS stuck at the booting process and shows the spinning wheel all the time. Therefore I used the recovery mode and re-installed high sierra again but no luck. During that time I have erased the Windows 10 SSD via Disk Utility as well. Tried to reset the NVPRM, in the restart process Windows BSOD came up and displays the recovery options. In startup disk the boot volume was set to Macintosh HD. Then used the Internet recovery, opened the terminal and entered diskutil list. It shows disk0 as Windows partition, disk1 as Macintosh and disk2 as recovery partition. But I can see partitions up to disk20 each having ~1 MB allocated space. Now I am running out of idea about how to recover the system. I have created an image of the Macintosh HD before using Internet recovery therefore I'm not worrying data loss. The image below was taken after I erased the Macintosh partition to install macOS again – I haven't installed it yet. The drives shown as (disk image) are temporary drives stored in RAM. These drive will disappear when you leave Recovery mode. You have successfully removed all windows partitions from your disks, but you have not yet removed all files added during your installation of Windows. What is left are files in your EFI partitions. 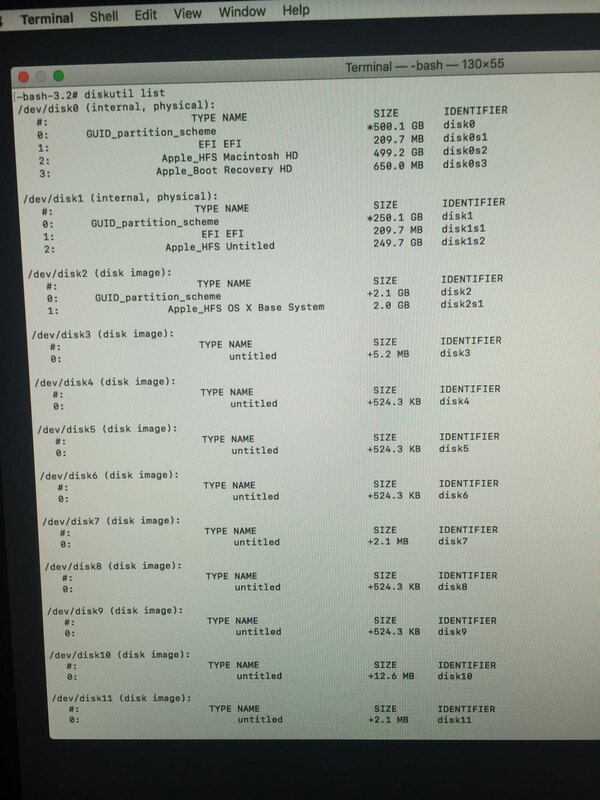 The ghost is being caused by the file efi/boot/bootx64.efi stored in one of the EFI partitions. When finished, enter the command below. If you booted to Recovery Mode or wish to just use a Terminal window, then enter the commands given below. Not the answer you're looking for? Browse other questions tagged macos bootcamp disk-utility high-sierra efi .